FTD is one of the country’s leaders in thoughtful gifts, floral arrangements and more. What you may not have realized is that they also offer gift baskets for almost every occasion. With their dedicated history of delivering on their promises and excellent customer satisfaction policy, they could be just what you are looking for when you are shopping for your next gift. A company with years of experience delivering gifts for life’s sentiments. 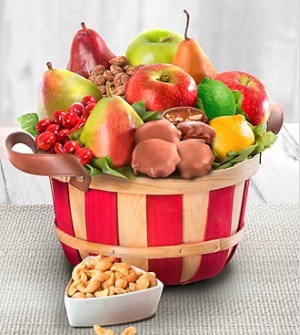 There is an extensive variety with FTD when it comes to their gift baskets – which is impressive when you consider all of the other types of gifts they offer outside of baskets. They include edible and non-edible options, offer wines and gourmet snacks, liquors, cheeses, chocolates, etc. Just some of the big brands they offer include Godiva, Starbucks, Lindt, Ghirardelli, Better Homes and Gardens, and Sonoma Jacks. They don’t have too many fun non-edible gift baskets – instead, most focus on spa themes. They don’t have any gifts for pets. Customization is limited with FTD, but that is to be expected from a big company. Instead of customizing, they offer ready and off-the-shelf options for faster order fulfillment. That being said, some baskets (not all) allow you to add an extra gift or perk to the basket, such as a teddy bear, balloon, flowers, etc. They do not allow substitutions unless they are ones the company has to do in order to fulfill an order – such as substituting for out of stock items. There are no design-your-own options with FTD either. FTD does have some baskets that can be upgraded or downgraded in size. They are classified by Good, Better and Best. These baskets increase in size and number of products. In their pictures online they are showcasing their Better option, but you can preview the other sizes as well. Searching by themes and sentiments is difficult with FTD because their search feature will automatically bring up other categories outside of their gift baskets – such as flowers, boxes, plants, etc. They do offer organic, gluten-free, Kosher and even sugar-free basket options. Some of the sentiments and occasions you can purchase your gift baskets for include things like holidays, weddings, anniversary, birthday, thank you, new baby, love and romance, just because, I’m sorry, get well, congratulations, etc. Not all baskets directly relate to the sentiment, but will show up in that category – which may make it difficult for those that want a truly customized basket for a particular shopping need. FTD is a big company and naturally they would offer corporate gift options with their baskets. The perks and features they offer to corporate buyers are what you would expect from a large company. They offer special pricing for businesses, bulk ordering programs, incentive programs, special events and promotional material options and corporate accounts for those that wish to finance their corporate gift baskets. Corporate orders can be placed online – something not all companies offer. Also, they have an entire department available for corporate shoppers. Price-wise FTD is rather competitive. They are able to offer better pricing than lesser known retailers simply because they have the means to negotiate better supply pricing with their own vendors. On average their baskets will range from $40 to over $150. They do have more expensive options, but most of their baskets are within that range. They do offer a hearty assortment of products in each basket – though some are sample sizes and not full-size products. FTD is known for same delivery, but that doesn’t apply to their baskets. It is only flowers that can be shipped same day – something we hope they change in the future. They do offer next day delivery though. For shipping, the shipping price is based off the merchandise total. Standard rates vary from $11.99 to $19.99 while next-day delivery ranges from $20.99 to $26.99 – still cheaper than other companies in some cases. They also have their membership program where for an annual free you always receive free shipping – but for one-time shoppers, this isn’t a big perk because the annual fee costs more than expedited shipping. They do specify delivery dates, but do not offer APO/FPO shipping. International shipping is available, but only on select items. Packaging is what you could expect from a vendor like FTD. They use high-quality baskets, feature name brand products and have a standard quality control measure in place to ensure all baskets arrive as shown. You can include a gift message with any gift basket ordered. They do offer a satisfaction guarantee with any product sold via their website. If you are unhappy with your order, you can request replacement or a refund via the toll-free number. If they guarantee a delivery date or offer a same-day delivered product and it doesn’t arrive, they will also work to make it right. Shipping fees are only refunded if the error was on the part of FTD Gift Baskets. If the error was not on their end and you are simply dissatisfied, you will only receive a refund for the product – not the shipping you already paid. FTD is available 24 hours per day, seven days per week. They can be reached via their 1-800 number or on email – though for emergency response you will want to use their toll-free number. They do not have live chat, which is surprising for such a large company. FTD Gift Baskets come from the larger counterpart of FTD Companies, Inc. They have been accredited with the BBB since 2004 and currently carry an A+ rating. Under $50 – There are a large majority of baskets under this price range. These include fruit baskets, snack towers, chocolate baskets, and even a few gourmet basket options. $50 to $100 – Most of the gourmet baskets fall into this range and include fresh fruits, fine chocolates, exclusive cheeses and gourmet crackers and some bottles of wine. The basket itself is nicer and sturdier as well. $100 to $200 – Most of the baskets with wine or champagne gifts will fall between $100 and $200. They often include multiple bottles of wine, fruits, fresh cheeses and gourmet snacks, chocolates or fun themed baskets paired with wines. $200 and up – Very few baskets are within this price range and those that are feature champagne, olives, cheeses, fine snacks and chocolates, and a plethora of products. FTD offers a large variety of gift baskets that can be used for almost any occasion. Because they have suitable pricing and reasonable shipping rates, they may be used by just about anyone. Also, because they are a more well-known and used brand, more customers may feel comfortable shopping with them first versus the competition. FTD is one of those brands you will instantly recognize and trust – which is important any time you are shopping online. They do have a good variety and we like that their shipping rates are more affordable than some companies – especially when it comes to expedited shipping. We also like that they offer more name brand items in their baskets – while some companies use no-name or self-made products. We wish FTD had more same day gift basket options – especially since they are a company often associated with last minute shopping. We also wish that they had a live chat feature considering the volume of orders they take in and number of people they deal with. Also, we hope that they adjust their website so that it is easier to search and browse gift baskets only. Under $50 - There are a large majority of baskets under this price range. These include fruit baskets, snack towers, chocolate baskets, and even a few gourmet basket options. $50 to $100 - Most of the gourmet baskets fall into this range and include fresh fruits, fine chocolates, exclusive cheeses and gourmet crackers and some bottles of wine. The basket itself is nicer and sturdier as well. $100 to $200 - Most of the baskets with wine or champagne gifts will fall between $100 and $200. They often include multiple bottles of wine, fruits, fresh cheeses and gourmet snacks, chocolates or fun themed baskets paired with wines. $200 and up - Very few baskets are within this price range and those that are feature champagne, olives, cheeses, fine snacks and chocolates, and a plethora of products.